"Everything sounds sexier in French." The contemporary romantic comedy, Le Divorce, may seem like a change of pace for the producing team of Ismail Merchant and James Ivory. And though the modern Parisian locales and snappy dialogue are a far cry from the duo's typically stodgy period dramas, the script, from Ivory and regular collaborator Ruth Prawer Jhabvala, retains the same fascination with manners and customs on display in The Remains of the Day. Adapted from Diane Johnson's National Book Award-winning novel, Le Divorce investigates the cultural oddities of the reliably snooty French. 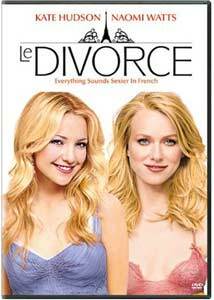 Isabel (Kate Hudson) is a brash young American who goes to visit her sister Roxy (Naomi Watts) in Paris. She's a romantic in love with the city, and with the notion of love, and her enthusiasm is not dampened when she learns that Roxy's husband Antoine (Samuel Labarthe) has left her for another woman. As Roxy deals with depression and the complications of divorce, Isabel becomes involved with Edgar (Thierry Lhermitte), one of Antoine's relatives, a politician and notorious womanizer. To a point, the ins and out of la-de-dah French society make for good comedy. Roxy, for example, is pregnant, which means she can't re-marry until she gives birth, though Antoine can do it as soon as the marriage is dissolved. And unless she files for divorce as the injured party, citing his adultery, she owes him half of her money and property; never mind that she doesn't actually want to leave her husband. Her in-laws are, of course, horrified by the scandal and Antoine's improper actions, but his mother (Leslie Caron) would never be so forward as to actually discuss financial matters with her daughter-in-law. Isabel, meanwhile, is treated to the good life. Edgar takes her to the finest restaurants, buys her a $6000 Herm�s bag (the kind Grace Kelly used to carry), and politely notes, "The only matter left is to decide whether you shall become my mistress." Glenn Close plays an American poet and artist living in Paris, an acquaintance of Roxy's and a friend to Isabel who recognizes all Edgar's tricks with the girl�there's a Grace Kelly bag tucked away in her closet, too. But wait, there's more story, including the jilted husband (Matthew Modine) of Antoine's mistress, a painting owned by Roxy's family that may or may not be worth millions, a murder, a suicide, and a ludicrous chase scene high atop the Eiffel Tower. And therein lies the problem with Le Divorce: too much story, too many characters. I couldn't remember half of their names, and I didn't care a lick about any of them, despite affecting performances from Watts and Hudson. Stockard Channing is delightful in a small role as Isabel and Roxy's mother, a tough Californian who wears her Santa Barbara mannerisms with as much pride as the stuffy French, but she's given little to do. I confess to not having read Diane Johnson's novel, but I can only imagine it's much more thematically sound than the muddled screen adaptation. The film retains so much of the book that for all its charms, it ceases to function as a coherent story. There is still a lot to like. Aside from the impeccable cast, there's the fact that this is a Merchant/Ivory production, which means you can expect richly detailed production design and careful attention to nuance and detail. I've seen few films so in love with Paris and with the indulgences of French society (two of the best bits are montages, one of French women in their fancy scarves, the other of artfully prepared French cuisine). That's reason enough to see the film, misguided as it is. When the dialogue confuses you or you're bored with the massive cast of characters, you can always let your eyes wander and admire the Parisian skyline in the background. Image Transfer Review: Fox offers Le Divorce in both widescreen and pan-and-scan transfers on opposite sides of a DVD-10, and both look wonderful (though of course, the latter is horribly cropped). I'm quite happy with Fox's decision to offer both formats on the same disc for the majority of their releases, particularly when they look this good. This is a very colorful film, and the cheery palette translates wonderfully to DVD, with rich, stable hues that light up the screen without any blooming or graininess. Black level isn't much of an issue in this sunny picture, but darker scenes look nice as well. I noticed no digital artifacting, edge enhancement, or aliasing, and only an occasional minor print flaw. Audio Transfer Review: Audio is offered in a suitable 5.1 track. It's very front-heavy, but not unexpectedly so, considering this is a rather low-key comedy. Though the surrounds do provide some support for the score, most everything is confined to the front soundstage. Dialogue always sounds crisp and natural, and the front mains able carry the score and limited sound effects. Extras Review: For some reason, Fox has neglected to include any extras, not even the trailer. Not that I mind about the trailer. Anyone who frequents independent theaters probably saw the clip about 600 times in 2003; I know I did. Le Divorce suffers from too much story and too many characters by half, but its exquisite cast and witty dialogue are generally engaging, and the Parisian scenery is particularly charming. The DVD looks and sounds great, but I wouldn't suggest anything more than a rental before the inevitable price drop �featureless Fox discs generally don't cost $27 for very long.